Nexeon HDI is a full-featured video frame grabber for high-definition video display and capture. It supports video inputs from standard and HDTV resolutions up tp 1080p60 as well as VGA display. Nexeon HDI comes equipped with an on-board video codec that supports real-time video recording and playback with audio. 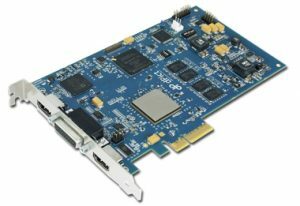 Nexeon HDI is designed with the high-speed PCI Express 2.0 system interface. The second generation interface allows for the Nexeon HDI to transfer data at speeds up to 1GB/sec. By incorporating a TI DM8168 video processor, Nexeon HDI enables maximum flexibility in handling challenging application requirements. Equipped with a 2 GB DDR3 SDRAM frame buffer, the video processor provides video scaling, pixel formatting, interrupt support, hardware overlay, and real-time video processing without host CPU assistance. Nexeon HDI comes equipped with a real-time hardware CODEC that enable video recording and playback. It supports multiple compression standards, including H.264, MPEG4 or MJPEG. Compressed and uncompressed video data can be transferred to system memory simultaneously. Nexeon HDI supports simultaneous capture and steaming both standard definition and high definition video and display with audio. Nexeon HDI supports HDTV inputs up to 1080p60 as well as VGA display inputs with aquisition rates up to 165 MHz. Standard definition support includes composite, S-video and component in NTSC and PAL. Audio inputs can be either digital HDMI or analog stereo. Nexeon HDI supports video output of both HD and SD video standards. It can output digital HDMI at resolutions up to 1080p and simultaneous HD or SD analog signals in RGB, S-Video or composite formats. dVeloper is a comprehensive software developers kit that supports all dPict Imaging products, allowing for easy porting to new hardware. dVeloper is royalty free and runs under Microsoft Windows 10, 8, 7, Vista, XP, and Linux operating systems. Source code samples and complete documentation are included in Visual C, C#, and Visual Basic .NET to provide insight to various hardware functions. Samples include video-in-a-window, overlay, video buffering, recording and playback, camera control, and more.